The service allows a consumer to dial #250 anywhere in Canada and the USA and then say a Spoken Keyword™ – .e.g. a brand or promo name, to the #250 platform to reach a desired service and therefore “voice enables” interactions that traditionally would necessitate typed interactions on a keypad. Speech as a mobile interface has gone mainstream, fueled largely by distracted driver legislation and therefore the #250 application is the right product in the right place at the right time in an ever-expanding mobility centric world. Talking instead of typing not only makes sense from a convenience and indeed safety standpoint but also promotes higher responses and accuracy of communications. Triton has partnered with Mobile Direct Response (MDR) to provide an unsurpassed mobile marketing platform that combines easy voice access for consumers with contact centers and location-based services that work on virtually all mobile phones. This combination maximizes marketing reach and response rates by offering timely, opt-in, location-specific offers, and providing consumers the easiest way to respond using their voice. Consumers see or hear an advertising call-to-action, “just dial #250 on your mobile phone and say (keyword)”. The “keyword” can be the advertiser’s brand or promotional name. The service therefore allows the consumers to respond in the way that is most intuitive for them. The essence of the service is that consumers do not have to remember or write down random phone numbers or short codes to reach the company. They only have to remember the brand or product name. This results in higher response rates and more sales! The service allows mobile users, irrespective of carrier, handset or operating systems, the ability to be reached on a national or North America-wide basis and interact for immediate direct response for brands, advertisers and general enterprises. Naturally, the value delivered includes higher response rates, accessibility and ease of use. One-to-one mobility anytime, anywhere communications where callers are routed to call centers for immediate service. 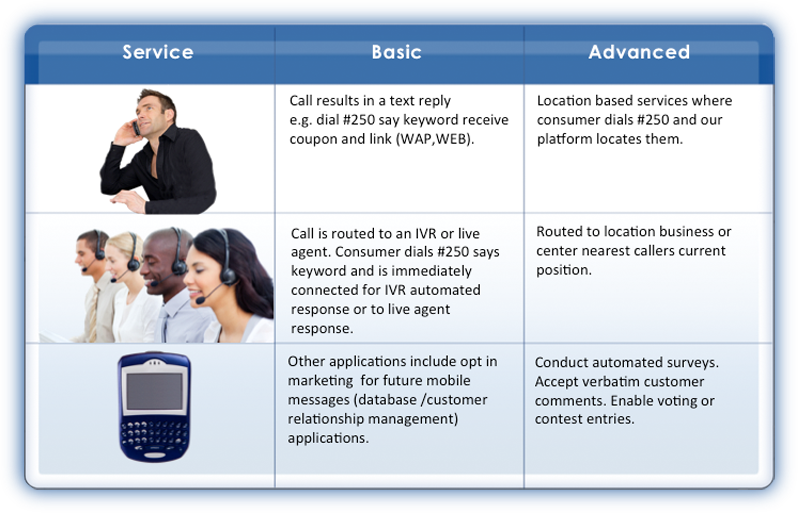 Brand marketing interactions with automated IVR voice services for alerts, notifications etc. Geo-positioned based applications to provide coupons, special offers etc. Category or commodity based business connections – e.g. Pizza, Health Clubs, Lawyers, Hotels etc. Brand based connections – Airlines, Buses, Trains, Banks, Radio Stations etc. The service creates endless opportunity as it not only supports North America-wide communication solutions and Canadian national solutions, it also supports regional and local solutions. The service is only limited by the availability of the desired keyword. Consumers see or hear an advertising call-to-action, “just dial #250 on your mobile phone and say a “keyword.” The “keyword” can be a name, the advertiser’s brand, a product or a promo name. The essence of the service is that consumers do not have to remember or write down random phone numbers or short codes to reach the advertiser. They only have to remember the brand or product name. This results in higher response rates and more sales! No other mobile marketing platform has such a North American wireless speed dial that spans the major carriers in the US and Canada. 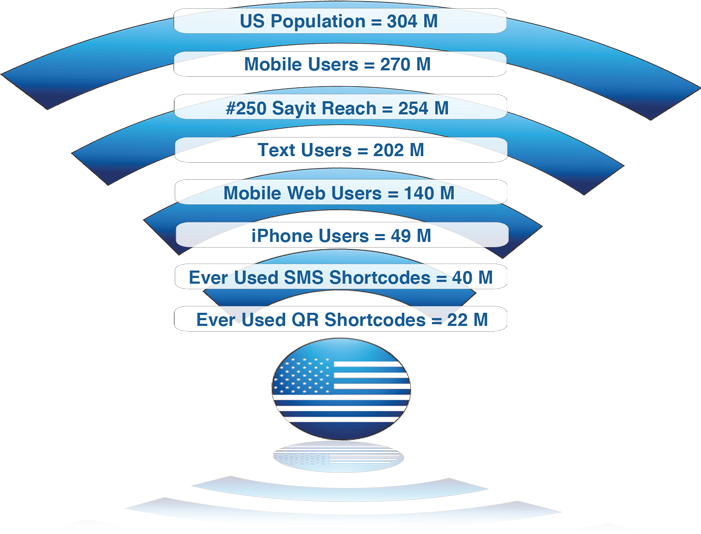 Given that your response rates will increase dramatically, there is no a better advertising value than Sayit To Mobile. With current distracted driver legislation, talking rather than typing makes sense for interacting with on the go consumers. Companies and brands can obtain a Spoken Keyword™ and secure a North America-wide solution to connect with customers irrespective of their mobile carrier, mobile device or geographic location. 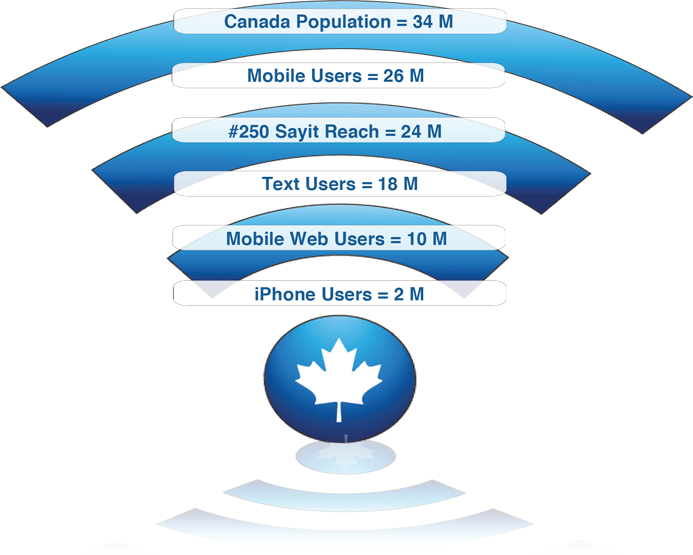 Clients who require North America-wide coverage will enjoy unprecedented mobile user access and reach to more than 278 million consumers. “Just dial #250, and say Keyword” – Around 50% of North American handsets do not have a QWERTY keypad, meaning a consumer would have to “triple-tap” a keyword using the number dial pad. Some age and social demographics do not regularly use text messaging, and therefore SMS messaging may not reach all of the intended audiences. The ability to use voice allows a broader demographic of users to access information. There is no need to remember a random shortcode, which may have very brief exposure… only #250 and the keyword. 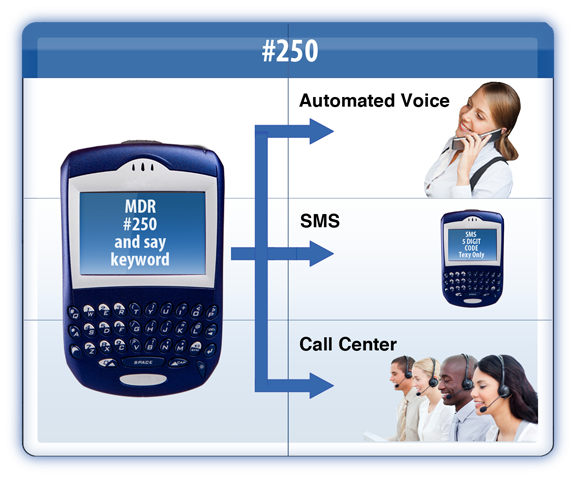 MDR provides more options – the user can hear a voice message or alert, be routed to a call center or receive a text message. THE MDR ADVANTAGE: These factors will raise response rates and branding dramatically , as more users will be accessible, anytime, anywhere. This chart illustrates the half-life of interest. It is hard enough to grab the consumer’s attention via advertising. If we can additionally interest them in our product AND motivate them to call (“The Moment of Conviction”), we certainly do not want any barriers to response. Primary barriers to response include the inability to remember or record regular phone numbers or random shortcodes. THAT is why it takes multiple exposures to get a consumer to act – NOT because they cannot be convinced upon first exposure to the message. When driving and listening to the radio, our hands are busy, and can neither record numbers nor dial safely (imagine hunting & pecking a vanity number on a two-lane highway). Texting is out of the question (even if we could retain the random shortcode that was briefly exposed to us). Dialing #250 and conducting business by voice is the only safe solution, short of abstinence. Don’t let the bean-counters limit your marketing. Higher response rates, not cost, is what matters. If you spend a few pennies more to make even one incremental sale, the ROI sky-rockets. And what if #250 doubles your response rates? Sayit to #250 Canada is a service provided by Triton Global Business Services Inc in partnership with Mobile Direct Response (MDR) and is comprised of experienced technology, telecommunications, and marketing veterans. 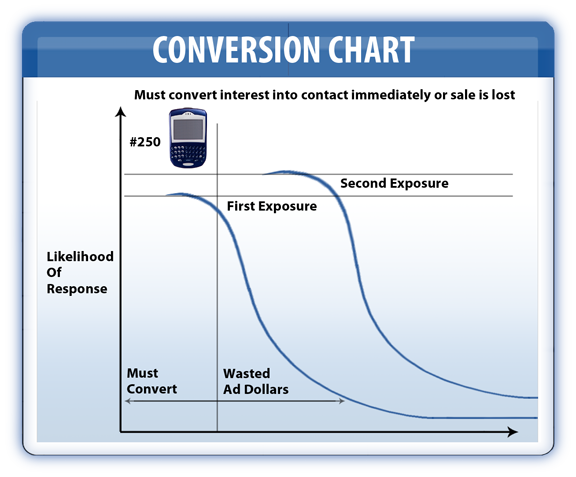 Sayit to #250 is a simple to implement marketing and advertising campaign tool with maximum reach to mobile consumers. 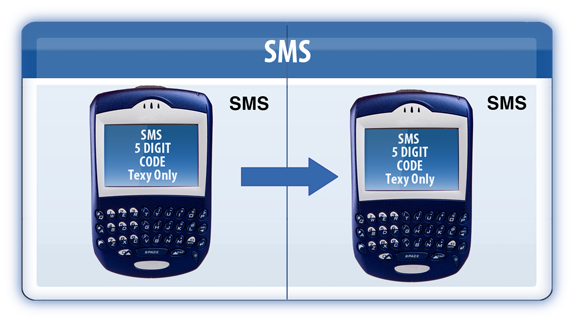 Sayit to # 250 has the unique capability of providing a standardized three digit Abbreviated Dialing Code (ADC) across 94% of all cell phones in the US and 95% of all mobile phones in Canada.